Home » Android » How to start a Secret Conversation on Facebook Messenger? Facebook has been bringing us latest features and helpful updates every few weeks. The latest in the row is the Secret Conversation feature inside the Facebook Messenger. This is an exciting update that will allow you to chat secretly with your friends on Facebook. 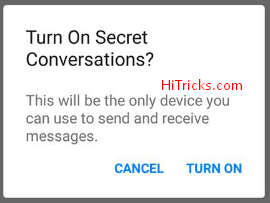 Well, the standard chat is also secret, but this secret conversation has some unique features that can make your chatting more entertaining. 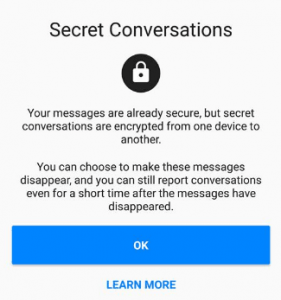 In this post, I will discuss the features of the Facebook Messenger Secret Conversation and tell you how to enable it and start chatting. So, let’s proceed to know what is this Secret Conversation. What is Secret Conversation on Facebook Messenger? 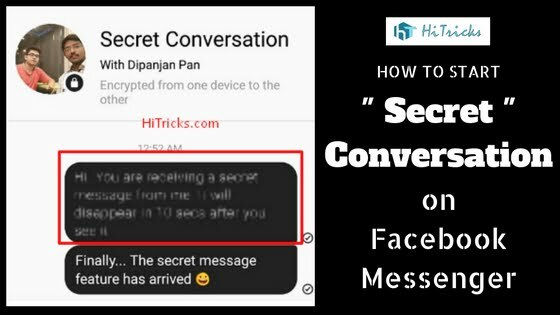 The Messenger Secret Conversation is a new confidential way to chat with your friends on Facebook. The secret conversation opens up as a different chat box with your friend, leaving out the normal chat box you use with your friend. All the messages you send are end to end encrypted between your device and your friend’s device. That means the chat stays right on your phone, and you cannot see or continue the chat from your desktop on the Facebook website.So, the chats aren’t uploaded to the Facebook Cloud Server. So, the chats aren’t uploaded to the Facebook Cloud Server. 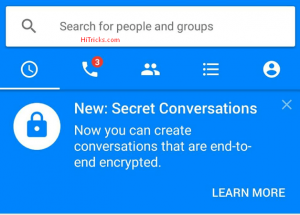 Here are the useful features and benefits of the Secret Chats. You can send text messages, pictures, and stickers inside the secret conversation. Videos, Gifs, and calls are not supported by the Secret Conversation. You can set a time limit for your sent messages after which the message gets destroyed. This can be from 5 seconds to up to a day after your friend reads your message. So, you can call it a Snapchat inside Messenger. Interested? Can’t wait? Me too. Let’s start messaging secretly. 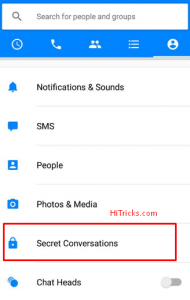 How to enable the Secret Conversations? Before you start a secret conversation, you need to enable it inside your Messenger. 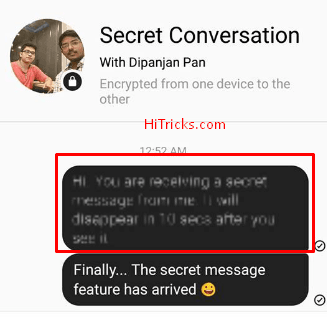 The Secret Conversation feature is in beta stage and rolling out to users gradually. So, you may not find this option inside your messenger. To know if it is enabled or not, you may check for this message on the top. Even if you don’t get this option yet, don’t worry. Try the next step. Swipe left to the rightmost tab. Scroll down to find a Secret Conversations option. 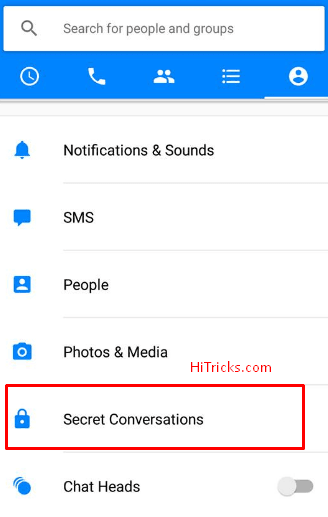 Click on the Secret Conversations option. You will get a popup. Now you shall find the options inside it. Turn on Secret Conversations from this device. You will get another confirmation popup. Click on Turn on. That’s all. Your Secret Conversations are enabled now. Well, If you cannot find this Secret Conversation option inside your Messenger App yet, kindly check Google Play for any updates to your Messenger app. Note that this option is rolling out gradually and may take some time to reach you. So, don’t worry. Here I give the download link of the latest beta version of the Facebook Messenger App apk file. There is no guarantee that installing this version will give you Secret Conversation option, but still, you can give it a try. 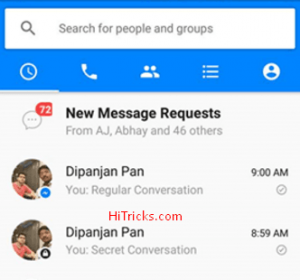 Download Facebook Messenger Beta Apk. 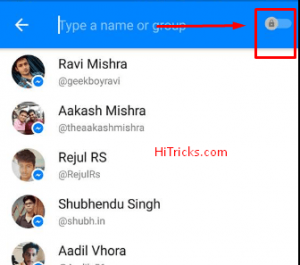 How to start a Secret Chat with your Facebook Friend? So now you have enabled the Secret Conversation options, you can now actually start chatting with your friend secretly. On the Chat Tab, click on the Plus ‘+’ button, and then click on Write Message. 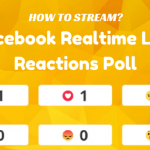 It will show you a list of friends to chat with. 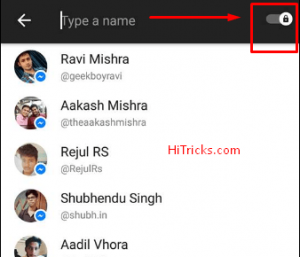 You can also type the name of your friend whom you want to talk with. You can find a lock button on the right side of the search box. Swipe the lock towards a right to start the secret chat option. You will see the blue color theme will change to black, confirming that the Secret Chat option is now begun. Now search for your friend and start chatting. There’s a lot of fun in there. 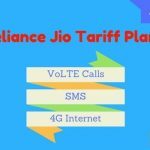 YOU MAY ALSO LIKE: How to Get Reliance Jio Welcome Offer on your Android Device? 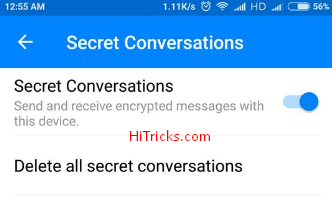 How to verify your conversation is Encrypted? As I said earlier, whatever you converse with your friend stays between your device and your friend’s device and cannot be traced elsewhere. 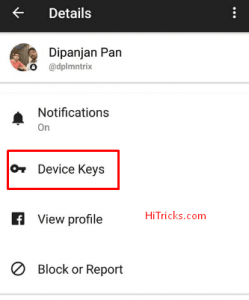 This can be verified using device keys. On an existing secret conversation, click on the ‘i’ button at the top right. You shall find these options. Click on the device keys. You can see some keys there. 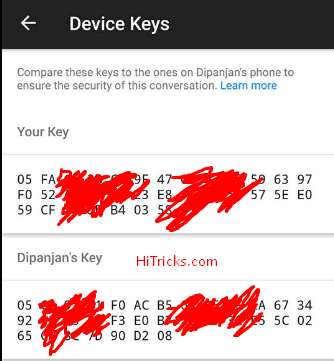 Now you can compare your keys with your friend’s keys on both the devices. If they match, your chat is secure. Just a tip, these will always match. That’s how the conversation is created. So, even if you do not test it out, no issues at all. This is just of the enthusiastic fellows. That’s all. Thanks for reading my post on how to start chatting secretly with a friend on Facebook Messenger. Hope you understood and liked the post. I will be back soon with new tech updates on HiTricks. Till then, go through my other posts. Have a good day. Cheating partners will be happy in this feature. Lol. But against any cheating on relationship hacking is the best to caught them. Maybe Titanium backup can track this one.